RealMag is a modern, user-friendly and professional blogger template. It is clean and modern design for blogger users. RealMag is a modern, user-friendly and professional blogger template. It is clean and modern design for blogger users. It comes with several handy features that are both good to run a successful magazine blog, news blog or etc. It has several popular built-in widgets that means you don't have to install any external widget by yourself. 100% Pure Responsive: Previously we released xmax - one page responsive blogger template, just like that this theme is also fluid layout responsive template. You can resize your screen or use a mobile device, it would adjust according to it. Automatic Update Featured Post Most people ask for a way to display some feature post on their blog that updates automatically. We have included a feature post widget that works with labels and shows up post in the featured area automatically. Which means you don’t have to edit the codes again and again? Static Homepage This template gives you the flexibility of having a static homepage. You can add widgets to your homepage but those widgets will not appear on posts or pages. Dynamic Fluid Layout The template comes up with dynamic fluid layout that is unlikely to see in most of the free blogger templates. To modify Feature top Label, go to Blogger.com >> Layout >> WHAT'S TRENDING? >> Edit, and paste the following code in the HTML Text box. Note: Replace "Featured" with your Label. Remember: The spelling should be accurate otherwise it would not work, even take care of upper and lower class letters. 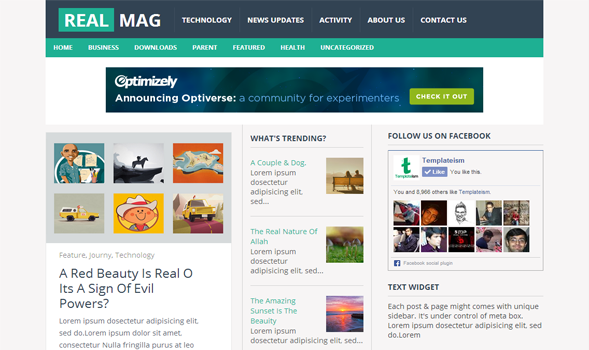 We hope Templateism is continuing its trend of producing quality blogger templates like we have released today. Let us know what do you think about this template, do you like its feature, any improvement you want to suggest? Feel free to leave a comment below.